Vegas Jackpot Keno Guide & Review - Casino Answers! Vegas Jackpot Keno is an online keno casino game developed by Rival gaming, featuring higher payouts than the regular game of Keno at Rival online casinos. You can play Vegas Jackpot Keno at US-friendly casinos . Vegas Jackpot Keno has a fairly basic design. A nice and simple one which makes it easy to use. The background is red with “WIN” cascaded in the background. The paytable is listed at the left with the results on the right of the game numbers. To play Vegas Jackpot Keno, select a bet of $1, $2, $5, $10 and $25 per round. You can play 1, 5 or 10 rounds at a time. You will be able to select 1-10 numbers or use the “QuikPik” button to select your numbers randomly. Hit the “Play” button to start playing Vegas Jackpot Keno. When playing 10 numbers on Vegas Jackpot Keno, the full payout schedule is as follows (payouts in parenthesis): 0 numbers (11), 4 numbers (1), 5 numbers (2), 6 numbers (4), 7 numbers (40), 8 numbers (500), 9 numbers (5000) and 10 numbers (20,000). Vegas Jackpot Keno offers higher payouts when compared to the regular Rival Keno game. It’s also interesting because you can get a good payout for hitting no numbers, proving that having no luck can be better than having a small amount of good luck. The negative to that is that you will not get any payouts for 1-3 numbers. Is there a progressive jackpot on Vegas Jackpot Keno? There isn’t a progressive jackpot on Vegas Jackpot Keno, but instead a top payout of 20,000 coins. Can players from the United States of America play Vegas Jackpot Keno? Players from the USA are welcome to play Vegas Jackpot Keno at casinos that offer Rival Gaming software. Can I play a free Flash game of Vegas Jackpot Keno? Keno – Vegas Jackpot is casino game made by Rival Gaming, a subsidiary of a Cyprus-based parent company called Black Chip Limited. A snapshot of Keno – Vegas Jackpot appears like a lottery ticket, and players are reminded of the bingo game. Traditional Keno, Extra Draw Keno, and Keno Exacta are examples of other keno variants. The term “keno”, which has been Americanized, is a corruption of the French and Latin terms “quine” and “quini”, which mean things pertaining to five. Keno – Vegas Jackpot would not have been the game it has grown to become were it not for Cheung Leung. Leung, a leader in the Han Dynasty, sought to create a game that would assist him to get the much-needed funds for expensive military campaigns. Luckily for US casino operators, they familiarized themselves with keno courtesy of immigrating Chinese citizens. Like in the majority of keno variants, Keno – Vegas Jackpot has 80 numbers, which is a considerable reduction seeing that Leung’s invention supported 120 suchlike symbols. Players choose numbers then click the “Play” icon; the pay table depends with the hits. Keno – Vegas Jackpot graces the list of keno games with the highest possible payouts, which is 100,000 times the stake for ten matched numbers; other payouts are 10,000 times and 500 times the bet for nine matched numbers and eight matched numbers, respectively. It may sound absurd, but the bonus feature of Keno – Vegas Jackpot enables players to get paid 11 times their bet wherein all chosen numbers are not drawn. The minimum amount of bet for Keno – Vegas Jackpot is $1 while the maximum is $25. Unlike in other keno variants, such as Traditional Keno, where players must choose at least two numbers in a particular round, Keno – Vegas Jackpot players can decide to choose only one number in a round. An outstanding thing about Keno – Vegas Jackpot is its “Quikpik” icon, which enables players to let it automatically choose numbers for them. The only requirement is selecting—by using the “+” and “-” icons—the amount of numbers desired for a specific round or rounds. This feature, coupled with the “Play 10” icon, imply that playing the game can be virtually automated, or, better yet, players can play using a hands-free mode for long. 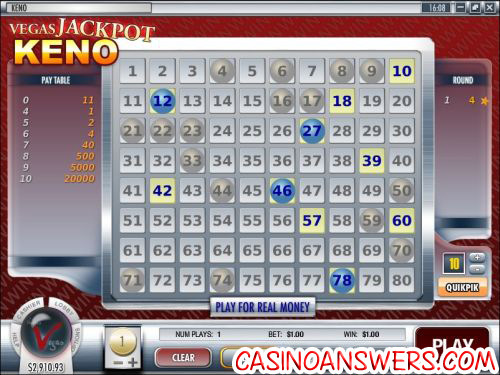 However, there are very slight modifications on Keno – Vegas Jackpot compared to some keno games. As such, keno variants—such as Traditional Keno when compared to Keno – Vegas Jackpot (for instance, these two have “Play 1”, “Play 5”, and “Play 10” icons among other similar features) — are more or less the same, their different names notwithstanding. Therefore, Keno – Vegas Jackpot might not give keno games enthusiasts a change of scene. Variables such as luck are essential in winning Keno – Vegas Jackpot rounds. Numbers 1 to 80 have an eightieth probability of being chosen, which means that strategies might not matter; but a player who chooses the maximum ten numbers in a given round has an added advantage over a counterpart who chooses only one number. Like the rest of keno games, the RTP of Keno – Vegas Jackpot can be anywhere between 65% and 80%, while the house edge ranges between 20% and 35%.